As Google expands their social mapping features, competitors are regrouping and refocusing. 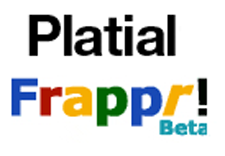 Kleiner Perkins backed Platial, headquartered in Portland, is announcing the acquisition of chief competitor Frappr this morning. Frappr co-founder Kun Gao will join Platial as part of the deal. Platial CEO Di-Ann Eisnor says the combined companies will reach 15 million unique users per month and will store 100 million user-generated location-based points of data, including photos, videos, reviews, stories and people (see examples here and here). 25% of all distributed map widgets on the Internet will be served via the platform. Frappr never took outside financing. Platial raised two rounds. They took $800,000 in angel funding in October 2005 from Kleiner Perkins Caufield & Byers, Omidyar Network, Ram Shriram, Georges Harik, Jack Dangermon, and Ron Conway. In February 2007 they raised an additional $2.6 million from Keynote Ventures, with participation from most of the previous investors.